Order chicken burgers, wraps, chips, spicy rice and more from a Nando’s restaurant near you. Get Nando's delivered to your door! 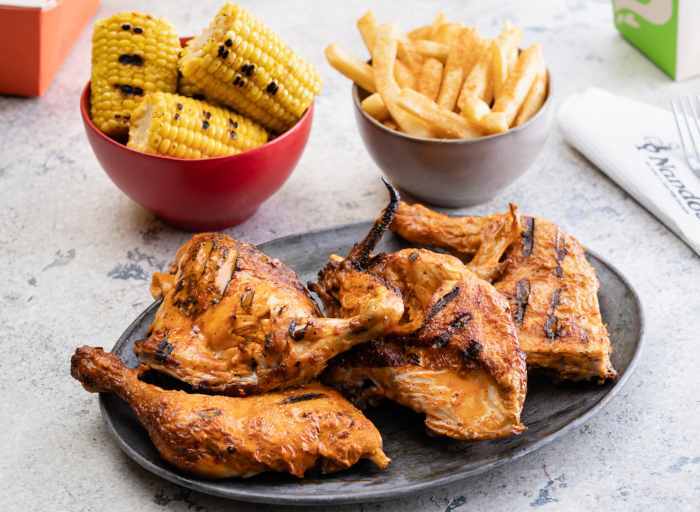 Inspired by the colours and flavours of Africa, Nando’s has taken the humble chook and transformed it into an exotic blend of succulent chicken, tantalising spices and scintillating sauces. A fusion of Portuguese and African cooking traditions, at the heart of Nando’s is the magical ingredient, Peri Peri. This smashing spice has a deep history, combining the red-eye chilli from Mozambique and the zesty lemon and earthy garlic brought over by Portuguese explorers, creating a new and exciting taste. From humble beginnings ‒ the first store opened in 1987 in Johannesburg, South Africa ‒ Nando’s has swept the world and now has over 1000 branches in 35 countries. But Nando’s offers more than just flame-grilled chicken! They also make scrumptious burgers, wraps, pitas, salads, chips, spicy rice, as well as a few specialities such as paella, meatballs and even chicken skewers. There’s even a menu designed for little tummies! It can be challenge to finding that that better-than-homemade taste, but with Nando’s, meal times can be a taken to the next level of deliciousness. Whether it’s lunch for two or feeding a family of 50, Menulog can make sure ordering and getting Nando’s straight to your door is an easy and super quick. With a menu packed with something for everyone, it’s easy to organise an epic feast without having to lift a finger.